Meet Carlo Gherardi, Country Director, Norwegian Refugee Council (NRC) Amman, Jordan. Listen to the career story of an Italian who grew up in the UK, and has gone from being an EU lobbyist via jobs in different NGOs all over the world, to where he is today as the Country Director for NRC in Amman, Jordan. Carlo Gherardi will share how he has grown both professionally and personally during his assignments and you will get excellent insider tips about the skills he is looking for when recruiting talents. “Every winter in Jordan is extremely difficult. You often have snowfall, you have temperatures at zero. One of our functions in the camps is to coordinate the distribution on behalf of all humanitarian agencies for what we call non-food items. So organizing distributions for 20,000 families and making sure that those are coordinated in a way where the most vulnerable are prioritized, where those people who can’t come and collect their items are supported by an alternative career, making sure that people don’t have to queue for too long, and just logistically managing that kind of operation is extremely challenging because people are tired and cold and often frustrated” - Carlo Gherardi, Head of Operations, Norwegian Refugee Council (NRC) Amman, Jordan. 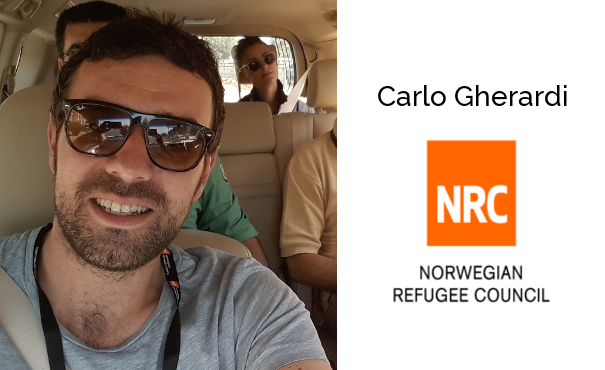 Meet Carlo Gherardi who is currently working in Jordan where NRC has one of the largest programmes supporting 150,000 displaced people in refugee camps such as Zaatari and Azraq. The realities and challenges of implementing and coordinating projects in complex settings caused by conflict and natural disasters, such as responding to the flooding in Southern Pakistan in 2010 and the current humanitarian crisis in the Middle East. The rewards you get from working with displaced people in Jordan. The different dynamics of the organizations working as a lobbyist compared to the development sector and how Carlos made his career transition. Norwegian Refugee Council (NRC) is recognized as one of the world’s most credible humanitarian, non-governmental organization. NRC promotes and protects the rights of refugees and people who have been displaced within their own country. The organization has a very strong operation side, which means that the aid they are actually delivering is going through their different programmes: on education, shelter, ICLA (information, legal assistance and counseling), or WASH-programmes (water, hygiene, and sanitation). NRC has also a very strong local presence in over 25 countries worldwide and has over 9,000 staff members working to provide people in displacement with these different services. Find more information about NRC here. To ensure that you will get all new episodes, we advise you to subscribe on iTunes, SoundCloud or Stitcher. Showing what you think about this show by leaving an honest review on iTunes is something we really appreciate. Carlo, thank you again for being such a great guest!